A Cowboy CompTM U.S. action job and a 25% shorter hammer stroke are standard features with Cimarron’s new Eliminator Series. This series was designed specifically with SASS and CMSA shooters in mind. Cimarron is proud to introduce The Eliminator 8, The Eliminator C, and The Eliminator TS. The Eliminator series is made exclusively for Cimarron by Pietta, which is a great gun, that you can carry using accessories as a cinch concealed carry jacket which is a perfect option for this. Cimarron’s new Eliminator 8 (Octagon) features a 4.75” octagonal barrel, checkered Army-style grips and a pre-war frame. It also boasts a 25% shorter hammer stroke for fast, easy cocking, which is a real plus for one-handed (duelists and mounted) shooters. Its striking profile is accented by a color case hardened frame, blued cylinder/frame assembly, and is available in 357/ 38SP and 45LC. Cimarron’s new EliminatorC (Competition) was designed with Cowboy Action Shooters’ needs in mind. 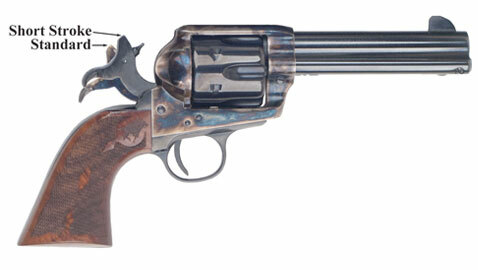 It features a 4.75” round barrel, checkered single action grips, and a pre-war frame. Like all guns in the Eliminator Series, it also boasts a 25% shorter hammer stroke and a Cowboy CompTM U.S. action job. 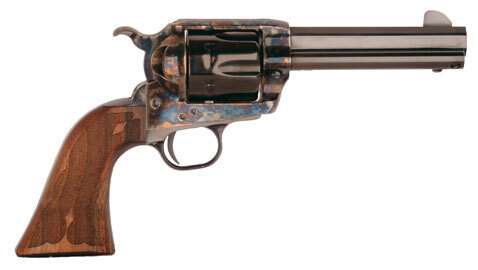 The EliminatorC features a color case hardened frame and blued cylinder/ frame assembly. Available in 357/ 38SP and 45LC. Cimarron’s new Eliminator TS (Thunderstorm) is available with a 3.5” or 4.75” barrel and checkered single action grips. Its specially designed Thunderstorm hammer is low and wide for comfortable no-slip cocking. The Thunderstorm hammer, along with the 25% shorter hammer stroke and Cowboy CompTM Thunderstorm action job make it an ideal competition gun for mounted shooters. The EliminatorTS is available in polished stainless steel and 45LC. For more information, visit www.cimarron-firearms.com.